No doubt you’ve heard of mind mapping. Perhaps you’ve even used mind maps yourself. But have you ever considered that mind mapping can help some of the people you serve in your outreach efforts? Outreach librarians are more aware than many other educators of the obstacles that stand between the people they serve and the joy of reading. Many people in the under-served communities whom outreach librarians assist have reading comprehension or retention problems of one type or another. Whether it’s a child with high-functioning autism, a teenager with dyslexia, or an adult who never really learned to read, reading challenges can hamper education, and stymie job prospects. Not surprisingly, a person with such challenges might be unlikely to make use of the rich resources housed within libraries, which is a loss for everyone. Enter mind mapping, which works on the time honored principle that a picture is worth (at least) a thousand words. A brilliant guy named Tony Buzan invented mind mapping in the late 1960s as a graphic method of making one’s brain operate more efficiently. 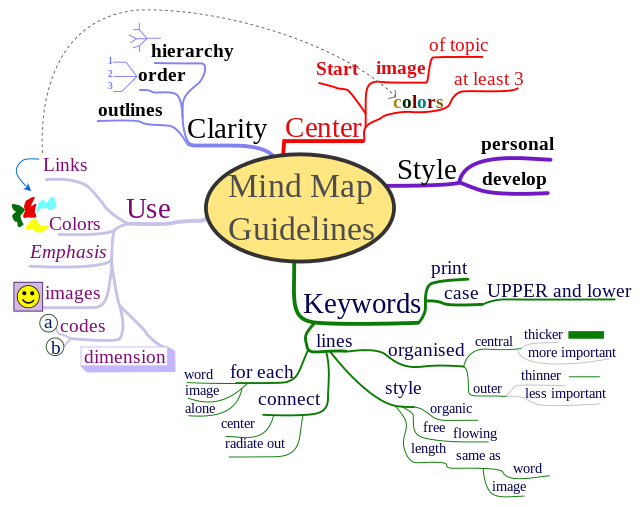 Today a lot of people teach mind mapping, and there are numerous software products and apps to assist in mind mapping. But you don’t need software to create a mind map; drawing one is pretty simple (though anything but simplistic). Essentially you start with a blank sheet of paper turned sideways, and begin by drawing an image or picture in the center of the page. Buzan says that starting in the center provides your brain with the freedom to “spread out in all directions and to express itself more freely and naturally.” In addition, he believes that a central image is more interesting, keeps you focused, and helps you concentrate better. From this central image, draw main “branches” (curved lines, not straight ones), and second- and third-level branches as necessary, labeling each one with a single keyword related to that central image. Buzan believes that curved branches keep your brain more engaged than straight lines, and that single keywords give your mind map more power and flexibility than phrases do. Use images and color throughout; color also keeps your brain more engaged than black-and-white or monochrome, and, as noted, a picture is worth a thousand words. Anyone can learn to create a mind map, and can teach others how to do it too. Here are some suggestions about the ways mind maps can help outreach librarians help their patrons. 1. Mind mapping can help struggling students study more efficiently. Despite the e-book revolution, most students still have to deal with print textbooks and other assigned reading, and they often feel overwhelmed.They may plow through the books and read the words, but retain very little. If you’re working with any of these students or their frustrated parents, perhaps you can show them how mind mapping beats highlighting text and turning down the corner of every other page. A quick and simple way to read books and remember more of what is read is to mind map the notes. An article by Arjen ter Hoeve on the Lifehack blog (http://www.lifehack.org/articles/productivity/how-mind-mapping-and-books-hand-hand.html) explains how to do this. Create a mind map for the book; make branches for the chapters (or paragraphs) you will be reading first. You can do this before actually reading the book; simply take the heading and create a mind map structure of the book. Read the book and add notes to the map as you go. Before long you’ll have a functional summary of the book, which you can keep as a guideline for reading and studying. Hoeve notes that the map itself provides the “big tour through the book,” and you just need to add new ideas and thoughts when you are doing more comprehensive reading. 2. Mind mapping can help encourage the reluctant reader. Many prospective readers are intimidated when they open a book and are met with what appear to be endless pages of text. This can happen with people of all ages, not just students. They toss the book aside without giving it a chance, never knowing what they’re missing. If you’re working with one of these reluctant readers and are familiar with the book in question, sit down with the person and help him or her draw a mind map of the book, using the same basic steps outlined in item number 1 above. 3. Mind mapping can help diverse readers. Whether it’s an adolescent with high-functioning autism like 13-year old Danny in this case study (http://www.mindmeister.com/downloads/casestudy_dannycayelli.pdf), or an adult with dyslexia (http://dyslexicprofessional.com/mindmaps-are-the-answer-whats-the-question), mind mapping can be an enormous help in reading comprehension assignments or in everyday reading and writing. 4. Mind mapping can help elders or dementia sufferers continue to enjoy reading longer. Many outreach librarians serve the elders in their communities, either through nursing homes, senior centers, or various clubs and organizations. Teaching elders mind mapping can help some of them continue to enjoy reading, and can even assist them in organizing and making sense of otherwise confusing information. 5. Mind mapping can help writers too. It’s been said that everyone has a book inside. Whether that’s actually true or not, the best writers are generally avid readers. If mind mapping can help readers, it can certainly help those who want to be writers. Mind mapping software exists to help writers develop their concepts, whether they’re creating a short article, a thesis, or a full-length book. Or they can simply sit down and draw out their mind map the old-fashioned way. If you’re working with an aspiring writer who has a great idea for an essay, a composition, or a book, but doesn’t know how to get started, share the secret of mind mapping with her or him. Rebecca Gray, a freelance writer with a BA in English from Texas A&M, writes about free background checks for Backgroundchecks.org. She welcomes your comments at her email id: GrayRebecca14@gmail.com.